The Fearless Presentations ® Public Speaking Class is one of (if not THE) most popular presentation skills seminars in the world. We teach hundreds and hundreds of Fearless Presentations ® courses every single year in cities all over the world. (We also provide a list of upcoming classes below for your convenience.) In addition, Fearless Presentations ® is the fastest, easiest way to eliminate public speaking fear and become a more persuasive speaker. The step-by-step process can also eliminate (or at the very least significantly reduce) presentation nervousness. Do you want to get rid of those butterflies in your stomach? Want to also reduce the shaky hands? Want to calm that racing heart? Or do you just want to think more clearly? Then this course is for you! For more details, visit the https://www.fearlesspresentations.com. We offer this two-day public speaking class in cities around the world for a tuition of just $1395/person! Day #1: How to Reduce and Eliminate Public Speaking Fear. 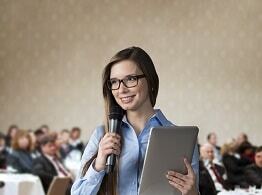 10 Ways to Eliminate Public Speaking Fear. How to Give Any Presentation without Notes (or Relying on Slides for Cues). A Simple Way to Eliminate Fear in Less than 2 Minutes. A Three-Step Process to Persuade Groups. How to Maximize Your Presentation Strengths while Reducing Weaknesses. Day #2: Design and Deliver Powerful Speeches. Design Entire Speeches (Including PowerPoint Slides) in 15 Minutes. Add Energy/Enthusiasm to Boring Material. 10 Ways to Add Impact to Any Presentation. We offer the Fearless Presentations ® Public Speaking Class every couple of months in over 50 cities around the world. Visit our public speaking website for a complete list of classes. Tuition for each 2-day public speaking class is just $1395 per person and seating is limited. However, group discounts are available. *We require that participants who request to pay by check must guarantee registrations with a credit card unless a check accompanies the registration. These participants must pay their invoice no later than 30 days after the completion of the class, or we will charge the credit card on file. We also limit enrollment for all classes, so we register participants on a first come, first served basis. In addition, your tuition includes a non-refundable $100 registration fee. Because the class space is limited to just a few people, no refunds or transfers will be given within 14-days of class start date. Participants may transfer to a future class after a $100 transfer fee is received in our office as long as at least 14 days advance notice is given by participant. Finally, participants who do not show for their class or who cancel within 14 days of the class start date will forfeit all tuition paid.